Strolling Staxx slots is a 5 reel and 10 payline video slot from NetEnt. 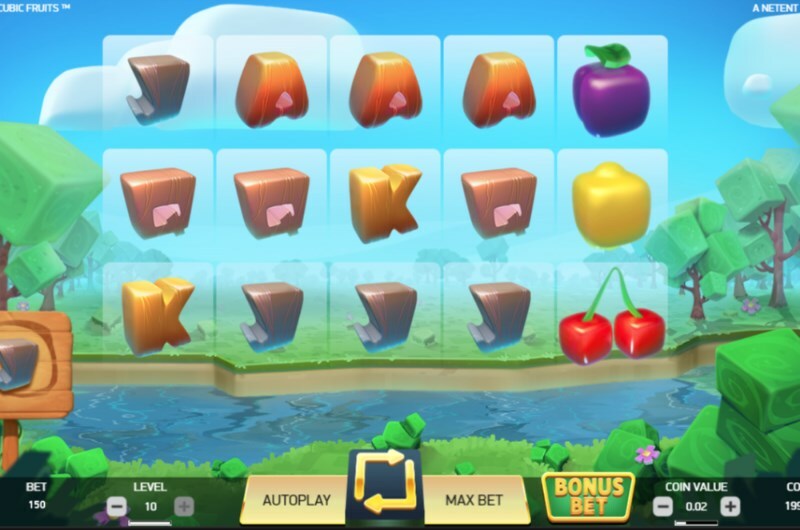 With colossal symbols, mega wilds and a special bonus bet - this game offers plenty of juicy action. There's also the chance to land a £100,000 max win in the base game and the re-spin feature. If you enjoy stacked symbols and re-spin features, then you will find this new game to be a delicious option. Find out just how juicy this game is in our Strolling Staxx slots review. Instead of Strolling Staxx slots free spins - we get something even better: the re-spin feature. And this will activate whenever a colossal symbol appears on the game reels. These super-sized symbols appear at random during the base gameplay. Every symbol in the game can have a giant 3x3 version - this includes the wild symbol. And once this symbol lands, the re-spins will begin. The stack will move one reel to the left with every re-spin. In addition, this feature can be extended if another jumbo symbol lands on the reels. The re-spins will then continue until the new colossal symbol exits the reel. You will notice that there is an option to activate an additional bonus bet. And for 15 extra coins, you will have a chance to trigger the extra chance bonus. After a base game spin with no colossal symbol added to the reel - the extra chance feature may activate. This will add the highlighted mega symbol in the reel for an extra winning opportunity. After which the re-spins will start. Strolling Staxx features an RTP of 95.98% without the bonus bet - and an RTP of 95.95% when the bonus bet is active. The medium volatility will appeal to virtually all experience levels. This kind of variance means a stream of steady wins - with the opportunity for some really big wins. The highest paying symbol in the game is the wild and melon symbols, with both paying 500 coins respectively. It's fair to say that the fruits are the most valuable symbols in the game. Each fruit boasts a 100+ coin payout for a five of a kind match. The card suit symbols pay a maximum of 50 coins for the same symbol combination. One of the best winning chances is if you can land a colossal wild symbol. This will ensure plenty of substituted wins from multiple re-spins. 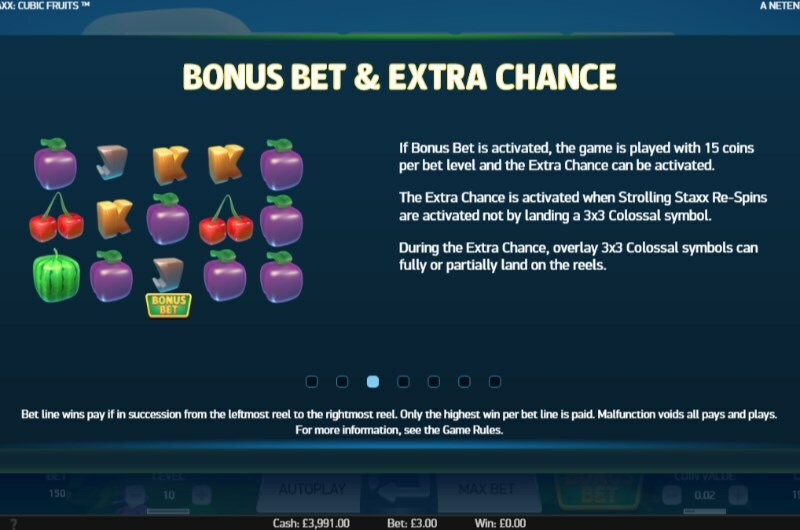 If landing colossal symbols is imperative to you, then we recommend activating the bonus bet. This slot slides right into NetEnt's casual and light-hearted slots games. Fans of Starburst will certainly enjoy the re-spin feature and the strolling stacks mechanic. These features blend seamlessly together, creating a slots experience that is as refreshing as a chilled fruit punch. If you want to sink your teeth into something juicier, then we highly recommend Strolling Staxx slots. Give it a spin now in our lobby - or check out our other NetEnt slots like Gonzo's Quest.